Director Lasse Hallström (‘The Cider House Rules’), whose recent output has been forgettable, provides a bit of class by taking an age to manoeuvre this synthetic duo towards the kissing stuff (shamelessly hackneyed highlights include – no, really – a sudden rainstorm). But none of this prepares us for a final reel which descends into the Vortex of Bonkers, delivering fits of unexpected laughter. 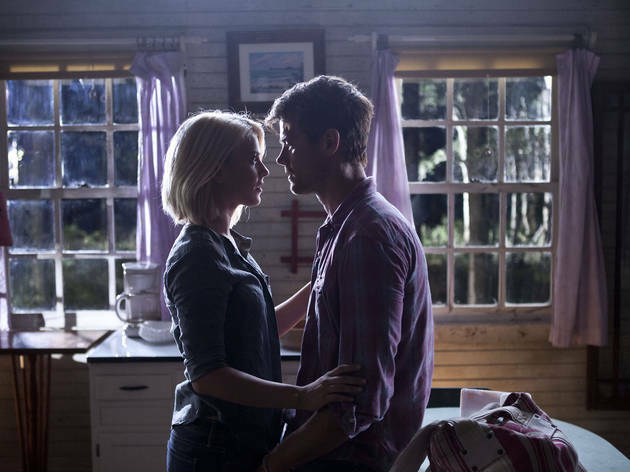 During those heavenly moments, ‘Safe Haven’ becomes a guilty pleasure, yet there’s much icky sincerity to wade through beforehand. Ok the film has its fair share of cliches as we see another identikit muscly man and skinny pretty blonde couple come together in another Sparks rom com. Like many film series the stars become less well known and no doubt cheaper as we go over the same ground again but it does provide for a diverting couple of hours. Cue obligatory scenes of Duhamel's chiselled torso and Hough in a bikini, yes they both look good by the way. However I for one was pleasantly surprised by the film and its core demographic will lap it up. There weren't many men in what was a reasonably full screening which makes me believe it will do quite well at the box office over the next week or so. There are a couple of twists which when they are revealed you will be surprised you didn't see coming. All in all I think I possibly enjoyed it more than the reviewer and more than I expected. Not a great rom com but more than adequate as both a rom com and as an advert for the Carolina's tourist industry. A reasonably solid three star film.